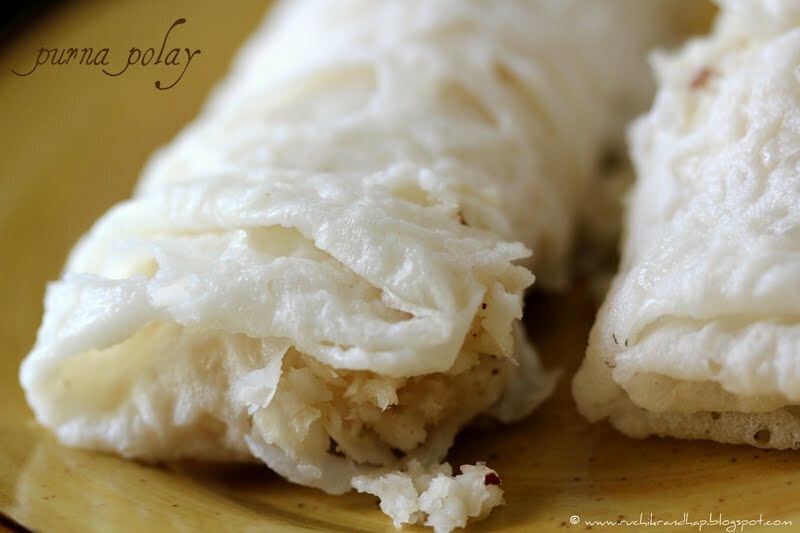 In my previous post I wrote about the versatility of the humble ‘panpolo’ – the neer dosa which is an any time treat. In Mangalore, traditionally, whatever has been prepared for breakfast often finds itself disguised and served for tea as well. For as long as I can remember, I have eaten the Panpole (pronounced as pun-polay) as an evening snack with a deliciously simple sweet filling of the coconut & jaggery. It is the perfect snack to beat the 4pm hunger which often grips me & drives me insane. 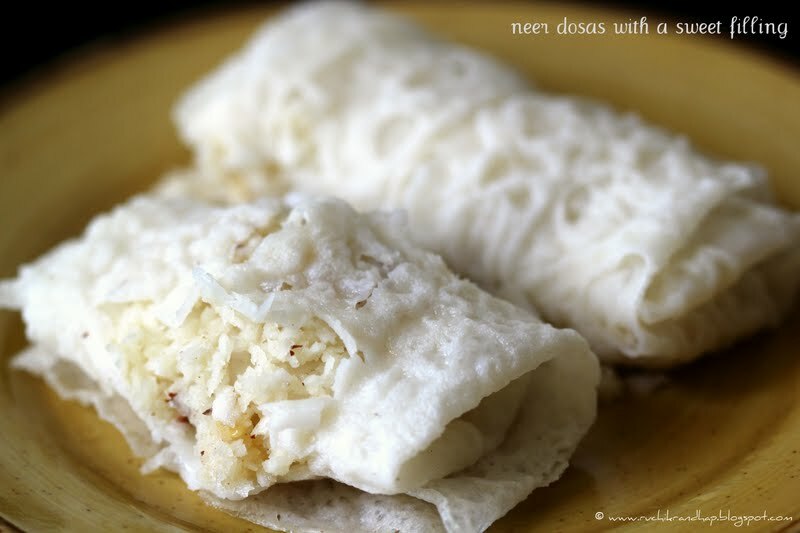 It is so simple to be put together – you dont need to heat up the dosas again. Freshly grated coconut is preferred as it is more juicy than its frozen counterpart. 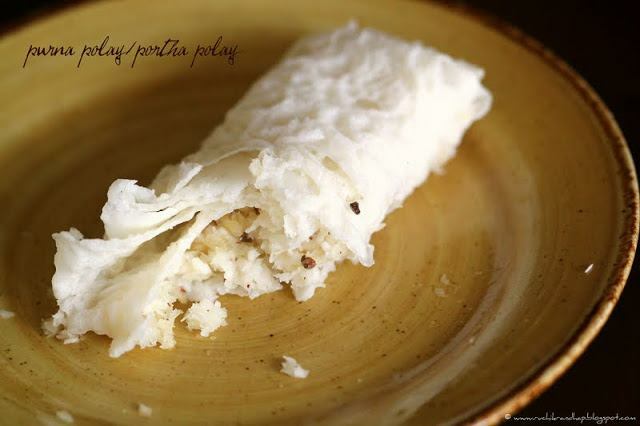 The name – purna pole (also spelled as purna polay) is interchanged with portha pole although it means the same. In today’s age, not many people stock up on jaggery, so the filling can be made with sugar as well. The one with jaggery tastes more authentic and is healthier too, but the sugar lends a different taste and kids like the crunchy sugar crystals to bite into. Mix all the ingredients for the filling and mash them well to ensure the jaggery doesnt have any lumps & has blended well with the coconut. Divide into two equal portions. Place the smooth surface of the dosa facing upwards and leaving about 2-3 inches on the top, place half the filling on the dosa. Fold the top portion first and then the sides (vertically) then roll it towards you (pretty much like a kaati roll). Serve! One of my fav. We call it elanchi. And make it with Maida too. Those pancakes looks simply out of the world, marvellous clicks..
Lovely pancakes..I really the coconut stuffing. These are my absolute favourite breakfast!!! I love them with spicy red coconut chutney, the contrast between the sweet and spicy is mindblowing. Thanks for this Shireen! You have a wonderful space. Please take a look at my space when you get time.